High-waisted trousers are a trend we don’t expect every man to be instantly on board with. Common sense dictates that anything which involves playing with the body’s natural proportions provides fertile ground for weirdness. No need to fret, though. This look has roots in the 1950s, a decade so stylish it’s currently enjoying its third comeback in menswear. Yes, decades before low-rise trousers threatened to expose more than a hint of your groin area, men’s high-waisted trousers were riding, well, high: and what’s more, they looked damned good. Since the laid-back heights of 50s fashion their style stock dropped lower than an open fly and a once well-worn piece of kit became looked upon with suspicion, like Crocs or cowboy boots. If you’ve been cowed by Lord Cowell, direct your mind instead to the likes of Marlon Brando and his smartly-cut navel grazers for a way more appealing take on the look. Styled correctly, high-waisted trousers offer a subtle way to show off your sartorial chops. With a tucked shirt, they can also make you look slimmer around the midriff and also elongate a stumpy pair of legs. Not sure how to start getting high? We’ve broken down the ‘fits and brands you need to turn to nail the raised waistband. Just make sure you’re not carb loading when you’re attempting this. If anything goes so jaw-droppingly well together as a Cuban collar shirt and high-waisted trousers come summer, we’ve yet to think of them. That’s precisely why the power pairing won throngs of fans around the middle of the last century: Marlon Brando and Sean Connery were both serial wearers, which is all the convincing any sensible man should need. But, that’s not to say the look is dustier than your nan’s net curtains: modern style heroes such as Oliver Cheshire and Lucky Blue Smith are regularly seen copping the Cuban. There are ways to update the look, too. The simplest route comes via print: stripes and polka dots will err on the youthful side of things and in the process neatly sidestep doing a way-too-literal Mad Men pastiche. If it’s warm enough lose the socks too: the apple polishing Ivy Leaguer is not the aim here. Wearing a pair of high-waisted trousers as part of a suit won’t work if you think too traditional – unless, of course, it’s your objective to channel your inner Bugsy Malone. The good news is that if you think a little less textbook, high-waisted trousers worn with a blazer works like a dream. 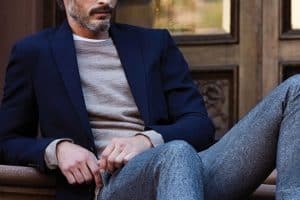 Essentially with this style of trouser, you’re upping the formality quota, so to get your suit to chill out a bit, you’ll need to swerve the shirt and tie for something a little more comfortable. A lightweight knit, polo shirt or T-shirt will do a fine job of getting your tailoring set-up to relax, and trainers are a strong shout here too. If you want to give your high-waisted trousers even more of a dressing down, simply mismatch the colour of your blazer and trousers. Does the thought of a polo shirt tucked into a pair of high-waisted trousers sound a little too alt-right for your liking? If so bear with us because provided you swot up on your outfit’s finer details, it’s a savvy style move which can make your wardrobe great again. First things first: your trousers should be neatly cut and big on quality. That means no pooling fabric around your feet and no ludicrously shiny finishes. Then comes the polo you pick. Anything that could be described as a standard polo shirt (read: pique, sports-inspired) won’t do here, you’ll need to seek out an open collared design, with no buttons and a textured weave. Chuck some white, navy or black Converse on your trotters and you’re part of the menswear crowd and won’t need to style the look with a flaming tiki torch. There’s perhaps never been a finer moment in the history of high-waisted trousers than when Marlon Brando wore his with a T-shirt tucked in for his turn in A Streetcar Named Desire. This ‘fit did a hell of a lot to propel the T-shirt into undisputed classic territory, ergo it’s forever indebted to the pants. It’s all well and good being one of the most iconic movie stars of all-time, but if your arms aren’t as buff as Brando’s and your smoulder is more suggestive of digestive issues, there’s hope left still. This surprisingly democratic look can be attempted by most via a grey or white T-shirt and some black or navy high-waisted trousers. Flip reverse things by trying a black T-shirt with pale beige, grey or tobacco trousers. To keep things feeling balanced, a simple pair of white trainers with minimal branding are your best bet. Staples that possess a tailor’s attention to detail is London-based brand Basic Rights’ modus operandi and thankfully that’s not marketing twaddle. Whether linen or cotton, black, brown or mustard, all of Basic Rights’ high-waisted trousers will make doing the mid-century modern thing a hell of a lot easier. On the one hand Swedish brand Cos is nothing if not minimalist: it’s all tasteful colours and clean lines. But on the other, the brand loves to play with proportion, which is where their high-waisted trouser designs come in. Fusing a trademark simplicity and razor-sharp cut with a northwards creeping waistband, these trews are your most modern take on a menswear classic. The French are said to be masters of wearing the classics well, and if the high-waisted trousers on offer from Editions M.R are anything to go by, we’ll begrudgingly concede defeat. Styles on offer here go low on attention-grabbing design, instead favouring a subdued (and infinitely more wearable) palette of navy, grey and dark brown. King & Tuckfield may be a relative newcomer to the menswear arena having launched in 2016, but the inspiration behind this retro-infused British brand is far older, hence its old-school approach to high-waisted trousers. Expect everything from Italian-made cotton numbers to unusual but wearable denim designs.